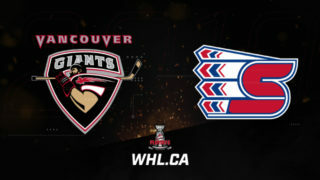 Tonight in Langley, the Vancouver Giants put their 2-0 record on the line against the Seattle Thunderbirds. It’s the first of two straight games on home ice for the Giants who are coming off back-to-back 3-1 victories over Everett last weekend. Seattle to their credit are 1-0 after a 5-3 victory at home over Portland on Saturday. Zack Andrusiak: The 20-year-old had a goal and two helpers last Saturday against Portland. He led all T-Birds with 36 goals a season ago. He jumped from six goals in 2016-17 to 36 a season ago. He was never drafted in the WHL Bantam Draft. He had four goals against the G-Men in 2017-18. 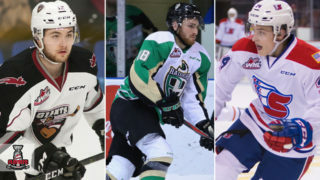 Dillon Hamaliuk: The 2000-born forward is eligible for the 2019 NHL Draft. He’s coming off a one goal, two assist performance from Saturday against Portland. He had 15 goals and 24 assists for 39 points through 72 games a season ago. Reece Harsch: The 1999-born defenceman did not play in the pre-season because he attended the Las Vegas Golden Knights NHL Camp. He also missed Seattle’s opener last Saturday with an injury. He’s listed as day-to-day on the team’s latest injury report, so perhaps his debut will take place tonight in Langley. Owen Williams: The 2000-born defenceman registered his first ever WHL goal on Saturday against Portland. He was acquired by the T-Birds in a trade with the Regina Pats last season that saw Aaron Hyman go the other way. He, like Dillon Hamaliuk is first time NHL draft eligible. Liam Hughes: The 19-year-old helped guide the T-Birds to victory on Saturday against Portland. He turned aside 30 of the 33 shots fired his way. Last season against the Giants, Hughes went 2-0-1-0 with a 2.56 goals-against-average and a .905 save percentage. Noah Philp: The 20-year-old led all active T-Birds with five points in four games last season against the Giants. Philp was held off the score sheet Saturday against Portland, but is looking to build off his 14 goal, 50-point campaign from 2017-18. James Malm: The 19-year-old leads all Giants skaters with two goals on the young season. He and Brayden Watts finished tops among all active Giants with a goal and two assists each against the T-Birds. 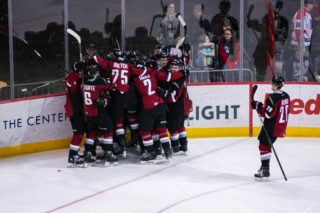 Jared Dmytriw: The Giants captain secured his first goal of the season last Saturday in Everett. His game-winner came mid-way through the third period with the teams skating four-on-four. Dmytriw is a +2 through two games. Dylan Plouffe: The 19-year-old led all Giants with two points (both assists) on Saturday in Everett. He also comes into tonight’s game with a share for the team lead in plus-minus at +3. He’ll get minutes in all key situations yet again tonight. Matt Barberis: 20-year-old Matt Barberis had two points in two games last season against the Thunderbirds. So far through two games he’s managed an assist and a +1 rating with two penalty minutes and four shots on goal. 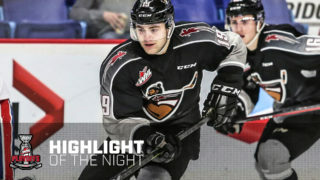 Only one player in the entire WHL was named the first star of a game twice last weekend. His name is David Tendeck. 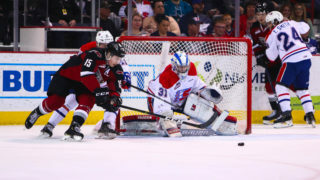 The Arizona Coyotes prospect stopped 57 of the 59 shots fired his way in back-to-back 3-1 victories over Everett. Last season against Seattle, Tendeck was 1-0-1-0 with a 2.95 goals-against-average and a .933 save percentage. Milos Roman: The fourth-round pick of the Calgary Flames has been kept off the score sheet through the first two games of the season. That won’t remain the case for long. He’s done a remarkable job in the defensive zone, and has been trusted to play in all situations. Could tonight be the night he breaks out offensively?